Detailed insight into features, possibilites and methods. Building screens is easy with the integrated screen designer. Everyone from trainee up to high professional can work in a project together. 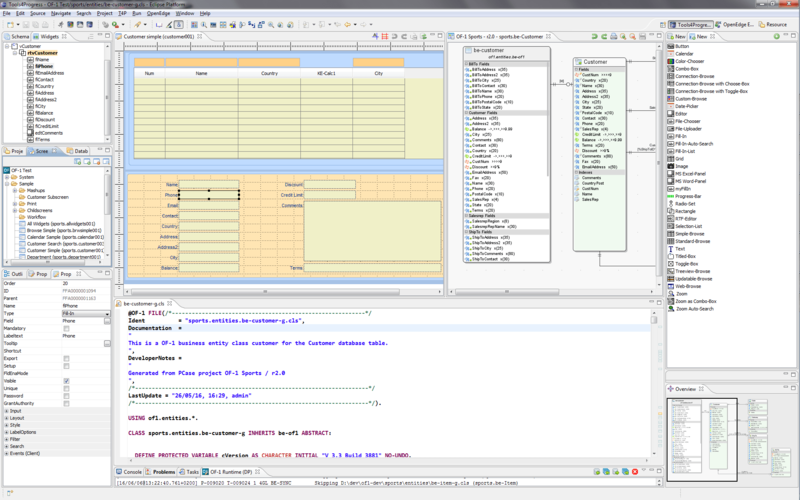 OF-1 is integrated into the OpenEdge Studio. It comes with a rich set of tools, including a visual designer, the graphical case tool PCase (to maintain ERDs and Business Entities), a wide selection of functional and visual components (including Telerik Controls) and much more. Screens (similar to program) and sub-screens (flexible container with the ability to snap in dynamically into a screen) will be drawn in the designer. They are able immediately to run (.NET and HTML5). 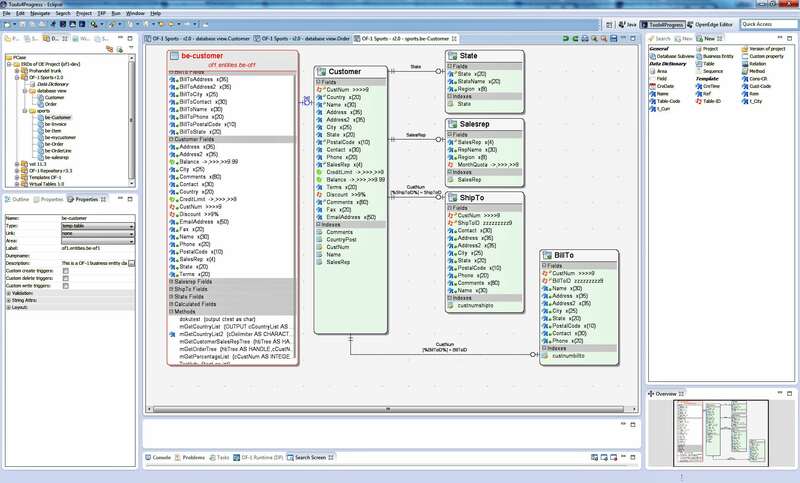 This part is 'no code' development and a trainee can create fast numerous master data programs. PCase – integrated into OF-1 – is used to define Business Entity Objects from physical tables and other attributes like calculated fields. The Business Entity are generated as classes. The developer make changes to the business logic in an inherited class. So the BE can be generated again, but individual changes in the business logic survive. 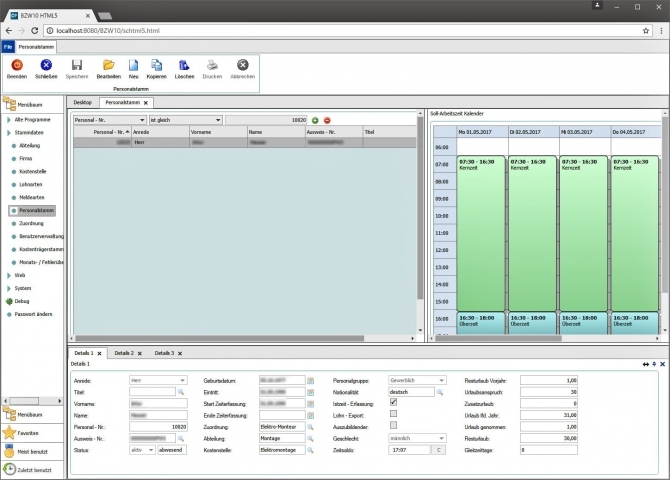 On screen and BE level deep customization of behavior can be done in the user exits. These exist are written in OO ABL. They allow changes for visible elements, but use abstract calls for this purpose. As a result, hook programming is UI independent and same for all UIs. Less code means saving time. The power of OO ABL, multiple Controls, multi UI/UX with web and on premise leads to great resulting applications. OF-1 is mature, since 2012 it is optimized to eliminate repetitive tasks. In most projects 50-60% of all screens need no programming, 20-30% have max 300 lines ABL code and only 10-20% have more lines. All screens run in .NET or HTML5, with or without AppServer. 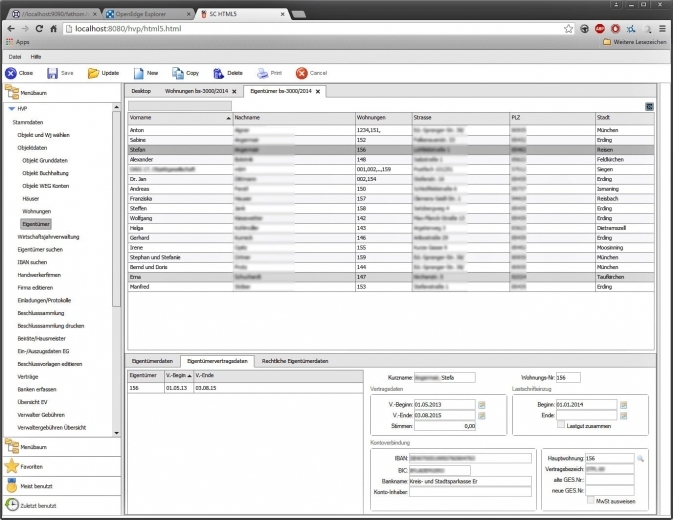 Customization of .NET and HTML5 UI screens is made with a single ABL code. To help the experienced OpenEdge developer, the API has calls/attributes similar to standard OpenEdge (e.g. kind of get 'screen-value'). Some code is generated, then it is used in inherited classes, so user changes survive, when code is re-generated. Components (container, field level, system) know how to handle any common situation without additional programming. Some of integrated time and code savers: Automatic browser filter fields, calculated and physical fields behave (filter/sort...) in the same way, Telerik Control usage is effortless via a container control, code completion is everywhere, custom controls, debug tools, User Administration, Translation, Right Management, Theming, – and much more. Proven strategies for application modernization (from Character, Standard Progress Client/Server, ADMx, DWP, Dynamics…) are ready to use. The wish for modernization of an application could be triggered from sales, customer demand, technology changes or is market driven. Often applications looks old, sales says: 'We could not sell anymore'. Or – Today's #1 – 'we need a web / SaaS solution'. Proven strategies are available to accomplish this. 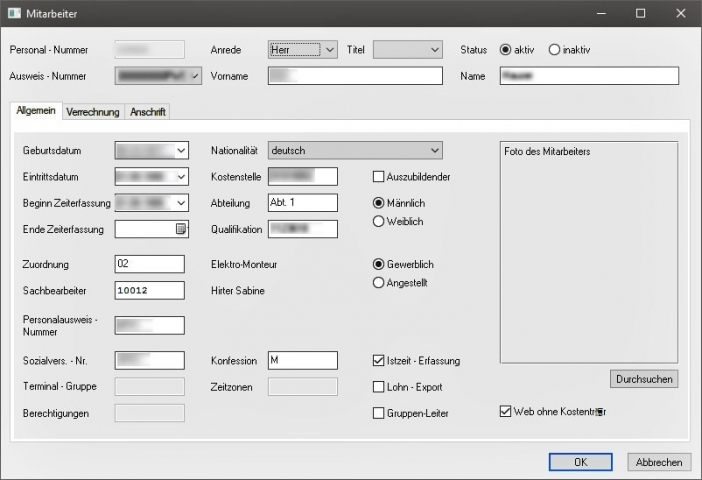 Soft Migration: Integrate existing screens (programs) in OF-1 desktop, then move screen by screen with a 'copy, change and improve' approach to OF-1. The application could be released during the migration. This removes the burden of maintaining 2 applications parallel (old/new). Hard Migration: This method will rebuild the screens and copy logic with minimal changes. This is very fast and has low risk. There will be no releases during migration, and the migration time is minimized. B-Solution had chosen the Soft Migration, the renewed screen by screen mostly during there normal maintenance activity. During that time they deployed a system containing new and old screens. After a few years they had migrated enough screens to run the application in the web with the first customer. HVPs goal was, to bring the existing ADM application into web as fast as possible, to address the SaaS market. HVP selected Hard Migration, and decided to keep the Look & Feel of the ADM application more or less untouched. 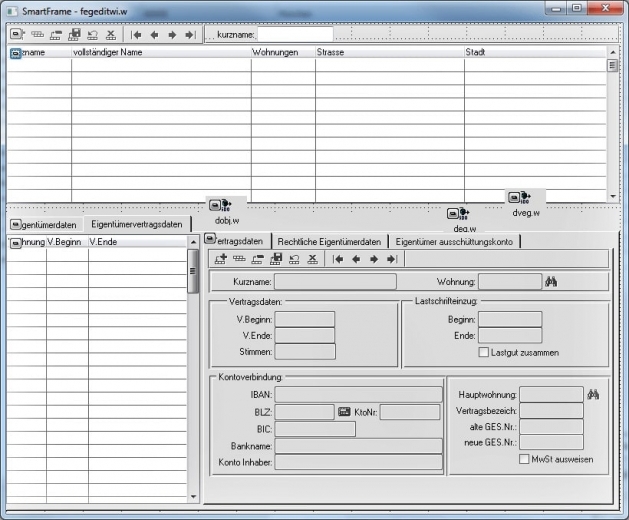 They added a few features, like workflows and mail system (written in ABL). Becoming more familiar with OF-1 (demos, workshops, PoC, training...) helps to make the right choice and finally the customer is able to work independently. IAP is a premier OpenEdge service and consulting company in Europe with a staff of 40+ people. There are several OF-1 training and support options. Web Session (cost free, 1h): Remote session, individual demo and question time. 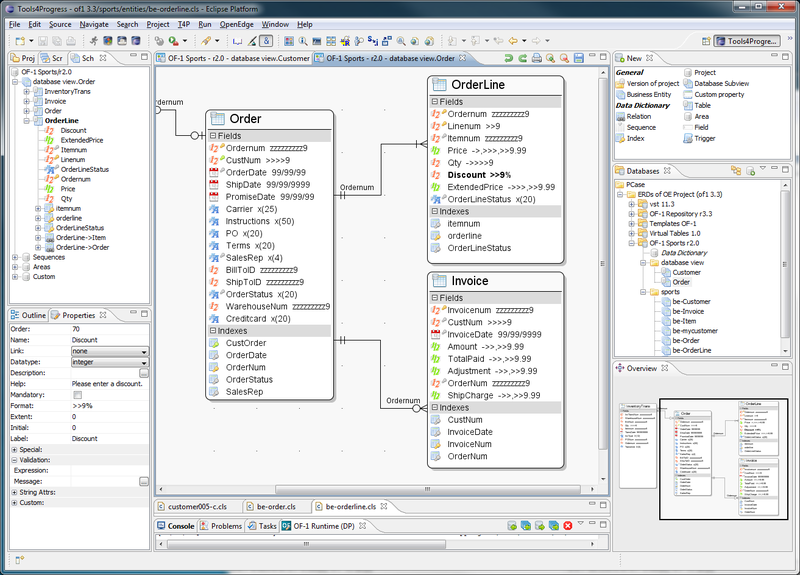 Workshop (paid, 2-5 days): Create a conceptual working demo with customer DB. All open questions are answered during the workshop. Proof of Concept (paid, 2-5 days): This interactive workshop will demonstrate how to realize application parts which are considered as critical for realization. Meet the decision makers (cost free): Discussion of partnership options, business presentation of IAP and OF-1. Training (paid, 3-5 days): Training amount can vary depending on size and knowledge of team. Coaching (paid, tbd): Our consultants work together with project developers. Support (Paid or in contract): Support has several options, support via mail or phone, coaching from time to time, let IAP realize parts of the application or everything. 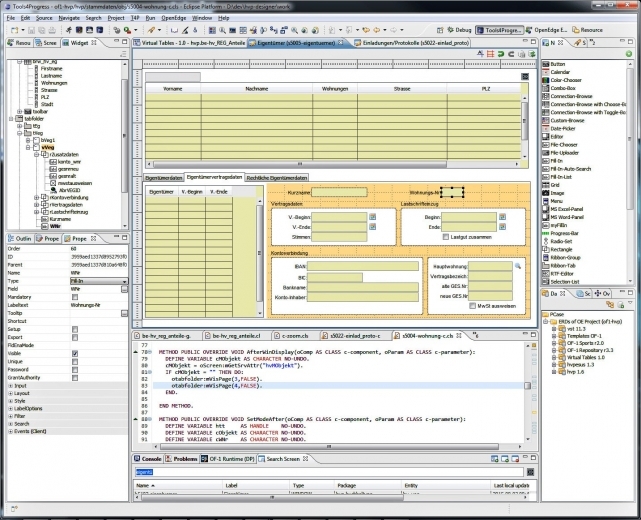 To make the customer independent, OF-1 is delivered with source code included. Call us at +49 (0) 40 – 30 68 03 – 0 or use the contact form below. These live demos will demonstrate the incredible ability of OF-1 to use various UIs. 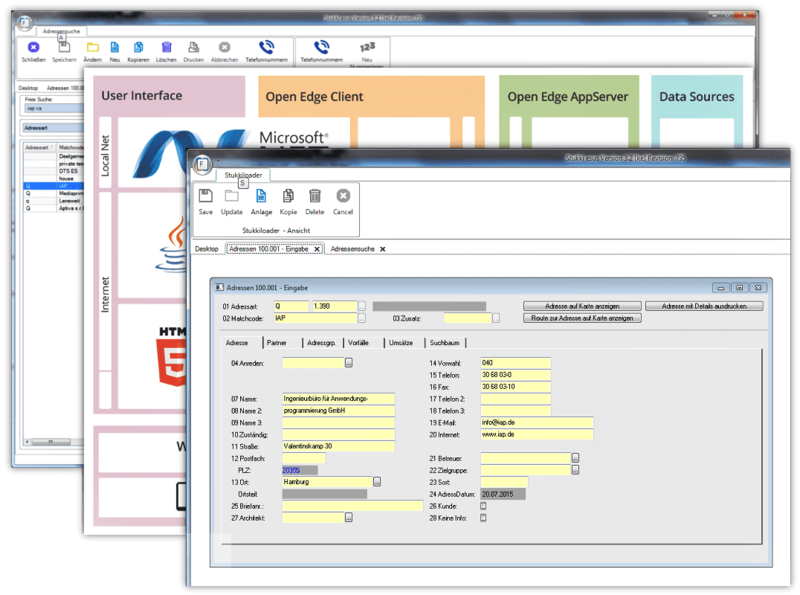 There is no better way to enable OpenEdge programs for SaaS on the web! Typical OF-1 application for the shop manager. See orders, staff and history data. To get an idea what is possible, you can see here various components of OF-1 in action. 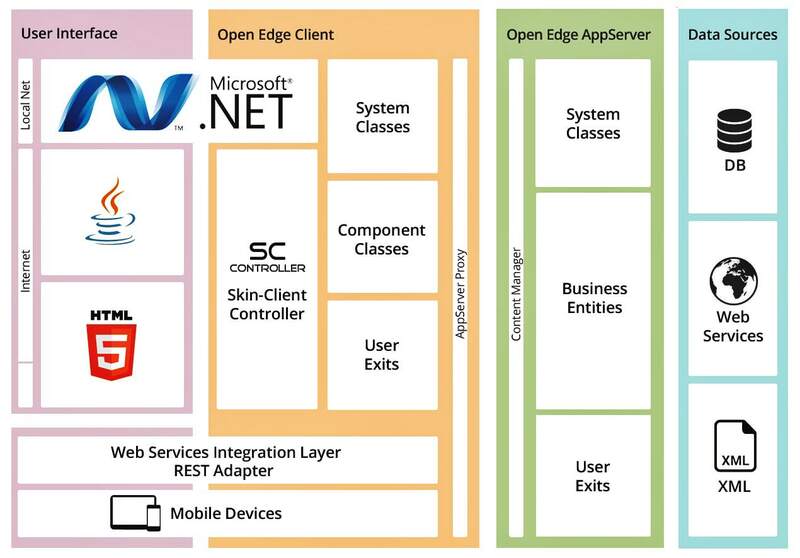 Skin-Client brings OpenEdge to the web - here is a base component demo. If you have a suggestion or a question regarding OF-1 do not hesitate to contact us via email. OF-1 is being constantly developed. You either can see the version history of OF-1 here or stay updated by a newsletter subscription (less than 10 letters per year). If so, then please don't hesitate to contact us. We offer a free presentation with demo via internet, it will take only 1 h of your time. Please call +49 (0) 40 – 30 68 03 – 0 or use the contact form below.